Many homeowners and business owners don’t discover that their roof has a leak until a hard rain starts to fall, and we all know that Iowa gets a fair share of rain every year. Many things can cause roof leaks. Some of these things are due to the wear and tear of Iowa weather on an ageing roof such as vents, flashing, shingle damage, rotting decking, ice damming. And sometimes (we hate it when this happens to customers), even if you have a newer roof, it can be caused by poor quality and improper installation. 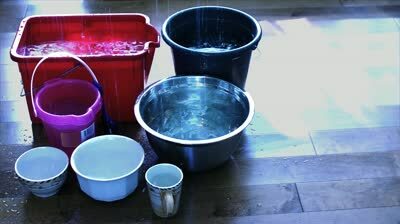 Where the leak is dripping water, place a bucket or pan to catch the water. Sometimes if the leak is serious, you can choose to poke a SMALL hole in the ceiling to prevent collapse of the sheet rock or tile; this allows drainage into the bucket. Use safety measures when performing this task with protective gear and help with your ladder. As a note of disclaimer: This will be a hole in your ceiling, Roof Iowa is not liable for any advice, decisions, or activities of self-performed work on your home. Call your five star rated professional roofer, Roof Iowa at (515) 612-3889 or contact us on our webpage at RoofIowa.com for a free inspection and inexpensive solution to the water coming into your property. When the roof is dry we’ll climb up and do the dirty work for you. We’ll check the shingles and define the leak source. Typically it is an easy and common fix that will prevent further damage until you are ready to invest in a complete roof replacement. To repair the appearance of the ceiling after the roofing tasks are completed, use some spackle and paint. We are also a roofer that can help with professional drywall and ceiling patching. If you can’t perform all of these things on your own, or you don’t have the proper equipment as well as safety measures to do it, then call us at (515) 612-3889 for a free inspection of your exterior home, as we will help you get the job done faster and with better results! We’re a Roofer, but we also do much more like windows, siding, remodels, carpentry and handyman work! We service all of Iowa, primarily central Iowa and the Des Moines communities of Johnston, Ankeny, Bondurant, Altoona, Pleasant Hill, West Des Moines, Waukee, Grimes – give us call for your free inspection. You won’t be disappointed with our quality and price!